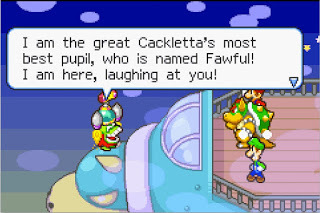 The first great fight in Mario & Luigi: Superstar Saga is against the corrupted form of the matriarch Queen Bean. The brothers Mario have several offensive targets to select, her crowned head and her two gigantic, body-builder-caliber arms that pound the ground and send shockwaves that injure any plumber that doesn’t properly jump over it. Pouncing on her noggin’ awards you nothing more than damage thanks to those pointy golden spikes, so you quickly decide to avoid that strategy, choosing instead to deflate her arms to knock the thing off and reveal her soft skull underneath. In this dazed state, she takes full damage and hacks up beans that hatch into additional enemies if the timing of your jump is off by more than a few frames of animation and you crack one open. Pay attention to its gameplay and Superstar Saga will teach you about virtually every important element of game design. As a matter of form, all games consist of action-creating mechanics and the structural systems that support them. In the case of Mario & Luigi, Superstar Saga is an action game housed in the structure of an RPG, applying direct actions into genre that typically uses menu-selection for every choice. By focusing on simplicity, M&L is in the perfect place to highlight a set of core concepts. That construction owes much to the foundation set by Paper Mario and its similar, but less profound, integration of platforming and JRPG’s. Anyone familiar with the two genres would be shocked by how well they merge: one of the most basic action genres, platformers have always been about the accurate placement of a single body in motion, using the character’s verbs and their animation systems to traverse obstacles and engage enemies; a product of the limitations of early home consoles, Wizardry-inspired JRPG’s have always been highly numbers-driven affairs, using variants on classic D&D attributes including strength and stamina to let your group of characters strategically battle enemies, whisking the party away from the world map randomly to battle in the secondary Combat Dimension. 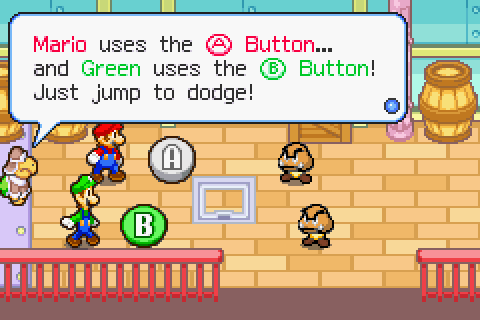 Mario & Luigi applies the former to the latter, assigning each Mario a button to hop and bop around a continuous world filled with enemies on-screen, giving them the chance to attack before the battle and enter at an advantage. The JRPG structure continues with turn-based battles of offensive and defensive phases. The decision to make the menu a ring of boxes floating above the character they smash into and receive the accompanying little ‘bonk’ sound is inspired, keeping the UI consistent with Mario’s timeless motif and their independently-assigned buttons. Giving the characters several options of attack adds basic strategy to the fight, as certain enemies (Queen Bean and her crown) can counter specific attacks. Since accurately pressed hits provide damage bonuses, that strategy is re-infused with action, stripping combat to its most basic concept: timing. But that’s just the beginning of its lessons. To help understand the true depth of the design, consider this: dexterity and intelligence are the only attributes a player can directly input into a game. Once you recognize that, you can start substituting a player’s real-life abilities for your character’s abstract stats. In its most basic formula, RPG’s calculate whether an attack is successful by comparing the attacker’s chance to hit against the defenders chance to dodge and rolling a virtual dice. Because all movements are passive orders and not active actions, the extent of any defensive strategy involves buffing before you get hit and healing after. Mario & Luigi scrubs that as a factor and puts in your hands by turning jump into an evasive maneuver, turning an action into a reaction. A good action game needs to be fair. It needs to put as much power in the hand of the player to succeed as possible while pushing their abilities to the brink. In RPG’s, any animation given to the characters is purely out of generosity and is ultimately completely inconsequential to the gameplay. Action games don’t have that luxury. Animations are a key element in videogame communication, letting you know that something is about to happen. For enemies, an animation provides them with a tell, choreographing an attack that you can prepare for. That every enemy has a different tell for each attack turns it into a game of observation and intelligent reaction. Timing your defense can be the difference between an evasion and a counterattack and incentivizes you to learn the length of a jump or the time it takes to ready your hammer. These are concepts that a player can apply to any top-tier action game, from Street Fighter to Devil May Cry, and learning them here yields high rewards as it is theoretically possible to go through game without being hit, minus a few in the tutorial. The bestiary is packed with enemies from across the series expansive gameography, providing engaging and varied gameplay. Early on you’ll fight Rex’s, those purple dinos from Super Mario World that compress when you jump on them, and get a taste of what’s in store. When they’re at their healthiest they’re also the most difficult to evade, as their height requires an exact button press to clear, but when they shrink with every hit, a good offense helps your defense. Then there’s the Bob-ombs that a turn lighting their fuse and can be extinguished under a boot, requiring the player to prioritize their targets. Those are nothing compared to the germs from Dr. Mario that change color every time they’re attacked and disappear when all are matched. These cleverly made enemies elevate the simple strategy almost to the level of puzzles without skipping a beat. Since every game is built by mechanics and systems, the difference between many genres is largely determined by which is given more real estate on a controller. There are several reasons why systems-heavy games use menus to select actions, but a primary one is that it becomes exponentially more difficult to simultaneously control characters in real time with every one that’s added. In fact, M&L was pushing it with a party size of two and had to resort to using the Game Boy Advance’s shoulder buttons to swap between the moves attached to A and B. But by doing so, the game applies direct action to a party that can be moved independently, even when platforming around the world. In battle, your abilities are tested anticipating which of the brothers the enemy is targeting, or dealing with a series of attacks that alternates between them. Even spells, which have long been ways to show dazzling special effects, pair the brothers up and require you to read the animation signposts and execute successfully. In these situations, a button press turns from being a single event into a rhythm you can grasp intuitively. Though the controls may be simple, keeping them consistent between modes keeps the player from getting more confused than necessary. And, ya know, pushing buttons is fun. And actually, pushing a button in time to not only avoid an attack but give one and get that satisfying little bonk to go with it is even more fun. The bonus to all the thought put in here is that it means you are acting more, defending more, pushing buttons more. Alternating between them, even. The Mario & Luigi games are some of the most fun JRPG’s I’ve ever played. It just feels good to play. Mario & Luigi’s design illustrates how mechanics and systems are different means of tackling the same ends and how one can stand in for the other to improve the whole. But it is also the beautiful intersection of the disparate ideas of personal growth that action and RPG titles bring to videogames. Mario & Luigi: Superstar Saga has its titular bros gaining experience and becoming stronger. You have learned to observe the enemy and anticipate their actions, how to form a strategy on how to defeat them, and developed your manual dexterity and coordination to input commands accurately, to decrease your reaction time to eliminate them quickly. You become stronger as the Mario Bros. do.